This can be so severe that affected pets can barely breathe. The more advanced the disease, the less the dog is able to exercise. Tracheal collapse (also known as collapsed trachea or collapsing trachea) is the narrowing of the windpipe that prevents the dog from getting enough oxygen and from getting rid of heat effectively. The disease is caused by a defect in the cartilage rings that support the windpipe. Instead of being round, the cartilage rings become flatter and flatter. As they become flatter, the trachea collapses more and more, and the dog suffocates progressively. There are 4 stages in the progression of the disease, from mild to severe (from Stage 1 to 4). 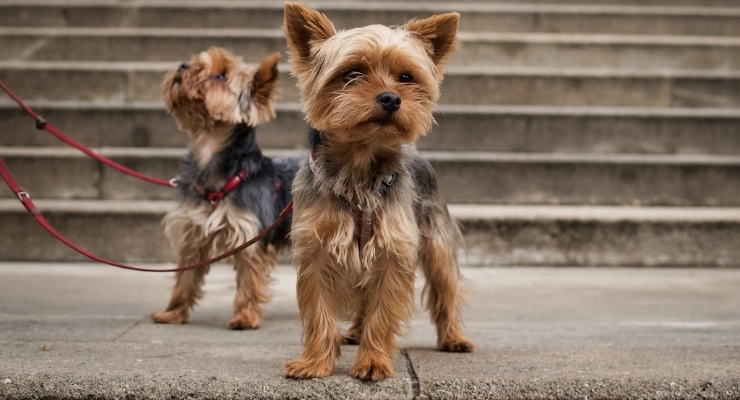 The condition is partially genetic, as the most commonly affected breeds are Yorkies, miniature poodles, Pomeranians (see video below), chihuahuas, and other small and toy breeds. Therefore, pets with the condition should be spayed or neutered to prevent spreading the bad genes to the next generations. The diagnosis is usually made based on the breed and the signs, especially the honking cough. To confirm the diagnosis, and determine the stage of the disease, tracheoscopy or fluoroscopy is required. Fluoroscopy is a fancy X-ray that allows the veterinarian to watch inside your pet in real time. You can literally see the trachea move and collapse as the dog breathes. If an X-ray is like a picture, fluoroscopy is like a movie. Tracheoscopy involves looking inside the trachea with a tiny camera under general anesthesia. It is considered the best technique. Most of the time, the first step in helping dogs with tracheal collapse is medical, or conservative. Invariably these dogs are overweight, which makes breathing even more challenging. If that is the case, a weight loss program is mandatory. Because these dogs can’t exercise safely, we need to work even harder on giving a weight loss diet and not spoiling them with treats and people food. Medications (cortisone, bronchodilators, cough suppressants and tranquilizers) may help, depending on how advanced the disease is. In an emergency situation, the family or emergency veterinarian would use the same medications in addition to life-saving oxygen. When the disease is very advanced or when medical treatment has failed, then surgery can be recommended. One traditional treatment that is not performed much anymore relies on external stents, plastic rings that are stitched to the outside of the windpipe. In effect, the stents pull the trachea outward and open it up to allow the dog to breathe. This is a delicate and invasive surgery that has worked over the years but can fail miserably. Frustrated and creative surgeons invented a revolutionary concept a few years ago: internal stents. These are fancy, expandable, ultra-light cylinders of different lengths and diameters to fit any size dog. The stent is made of metal alloys, mostly titanium. The beauty of an internal stent is that it is placed without any incision. It is a non-invasive procedure performed under fluoroscopy. Only a few teams throughout the country have the equipment and the know-how to place internal stents. Although the technique is not quite fail-proof, it is elegant. Overall, collapsed trachea is a stressful disease. With proper treatment, affected dogs can go back to a happy life. This pet health content was written by a veterinarian, Dr. Phil Zeltzman, DVM, DACVS, CVJ. Kelly Serfas, a certified veterinary technician in Bethlehem, Pennsylvania, contributed. This article was reviewed for accuracy by Dr. Pippa Elliott, BVMS, MRCVS, and was last updated Feb. 4, 2019.